Recently, I found myself revisiting my “why” more often than usual. The “why”, that reason you get up in the morning to do whatever it is you do; go to work, go to school, or work on your dream. The reason that keeps you motivated to keep going. Because, let’s face it, there are times when you might not want to keep going, and knowing your “why”, will help you stay the course, when the desire to quit arises. When I found myself continually going back to my “why”, I knew something negative and opposing, had surfaced. In this case, it was hopelessness, the feeling that what I dreamt of doing was impossible and my efforts to accomplish it, were a waste of time. I knew this feeling all too well, because I had to combat it several times during the course of my life. I had to overcome it, when I registered for College; no one in my immediate family had gone to college. I had to fight it, when I was promoted to Account Executive at a major advertising company; I never felt smart or worthy enough to even be considered for such a rewarding position. And, I knew I had to fight it again this time, or it would kill my dream. So, I reminded myself that I despised hopelessness, with every cell of my being, and that’s WHY I keep going. It angers me to know that someone is not living up to their full potential when they have everything they need to do so. I get annoyed when someone would express feelings of being incapable or unworthy of accomplishing their dream or fulfilling the desires of their heart, something that is totally in their control. When you’re feeling hopeless, you see and believe the worst about you and your situation. 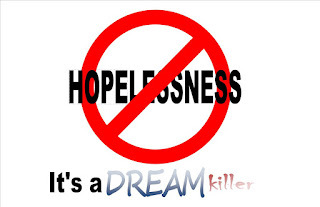 Hopelessness literally is a dream killer. No matter what it is you long to do or become, a feeling of hopelessness can keep you from living your dreams. Instead of using the power and inspiration you possess naturally to bring to life your heart’s desire, you’re plagued with feelings of doubt and unbelief that keep you stuck. And, contrary to what you might think or no matter how hard you try to hide it, that feeling of hopelessness is present in every aspect of you; how you dress, how you walk and more importantly, how you speak. When you allow hopelessness to take control of your life, it’s easy for people who have never met you, to discern the state of your life. Your walk is slow and non-purposeful. Your dress is disheveled, without care or thought. And, your conversation is peppered with negativity and unbelief. You become toxic. You see this dream killer in some of our most destitute communities today. People who seemingly have given up and resigned themselves to a life of addiction and futility, simply because they don’t think there’s more for them in life. When I drive down the streets of impoverished neighborhoods, and see men, women and young adults, just standing on corners with no aspirations or direction, it saddens me, because when I look at them, I see what Baptist Minister and Founder of Temple University, the late Russell Conwell would call “Acres of Diamonds”; valuable gems who have chosen not to believe in themselves and their innate abilities. Hopelessness cannot stay where there is Hope. Hope is defined as an optimistic attitude of mind that is based on an expectation. When you’re feeling hopeless, you have stopped expecting good in your life, you believe the worst for your situation and for you. The only way to rid yourself of this life stealing belief is to combat it with hope. List ALL your successes, everything you can recall that you accomplished when you were at your best. This will help you to realize that you are indeed capable of success by visualizing what t you’ve done in the past. Open yourself up to possibilities. If anyone ever accomplished anything, so can you! Begin to expect the best and believe that anything is possible, especially for YOU. Refer to your WHY often. When you return to why you do what you do, you will refocus your efforts on what matters and get back on track. If you let it, hopelessness will kill your dreams, the key is to not let it. Stay vigilant and keep watch for when it arises, then take the necessary steps to rid yourself of this dream killer. Regardless of your circumstances at that moment, expect the best for your life, and keep movin’, because the truth is anything IS possible for you. Always live with purpose…on purpose. and sign up to receive Detox Chronicles a bi-monthly newsletter with action steps to live life happy and whole!